The Occupy Wall Street protests have garnered a great deal of attention in recent weeks. The core argument is that the “top one percent” has gotten a free ride in the last few decades, particularly during the last few years where the financial sector has seemingly not been held to account for their role in the financial crisis. But who is the “top one percent”? Suzy Khimm on Ezra Klein’s blog sheds light on this question. You’d be in the top 1 percent of U.S. households if your income in 2010 was at least $516,633. Your net worth in 2007 was $8,232,000 or more, and your average income this year is $1,530,773. Khimm also shares some charts from Dave Gilson that looks deeper into who these “1 percenters” really are. In this chart, he notes that those in the top one percent have a broad range of professions. You’ll note from the chart than only 14 percent come from the financial sector, and a scant 2 percent are classified as “entrepreneurs.” As a side note, how did any professors make this list (1.8 percent)! This data doesn’t play into the story the “99 percenters” want to tell about the “top 1 percent.” The preferred narrative is that the top one percent come from the financial sector (e.g. their wealth is not earned in the same way an entrepreneur’s wealth is earned). What does this say about the validity of the Occupy Wall street movement? Should they be focusing their efforts on challenging concentrated wealth regardless of whether it is in the financial sector or not? Or is Wall Street the perfect villain? 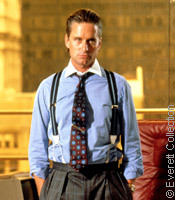 It is easier to claim that Gordon Gekko should pay more in taxes (Yah….that was his name. I know, we weren’t very ironic in the 1980’s). Does it matter if the story of who constitutes the “top 1 percent” is more muddled if the objective is met? Do the means justify the ends? All of the charts and data that I have looked at in Continuing Issues in Public Policies have made me believe that I cannot believe anything anyone tells me through charts and data or even words anymore. Humanities tutorial has the same effect. With this in mind, I cannot say whether or not the Occupy Wall Street Movement is valid, what they should be focusing their efforts on, or if Wall Street is the perfect villain. It is easier to claim that Gordon Gekko should pay more in taxes, but he can probably afford to have great tax lawyers work for him so that he does not actually pay very much at all. But at least there's something which I think seems logical: people who are smart about money will find ways to keep making a lot of money, even if they have to move to a different country to do so or hire people to avoid taxes. Excuse me? "This data doesn't play into the story the '99 percenters' want to tell about the 'top 1 percent.'" Maybe not into the story you WANT the 99 percenters to be telling. But nearly a third of the 1% are corporate CEOs, which highlights the huge and growing disparity in US companies between executive compensation and the flat wages of their underlings. See, for instance, "Cozy relationships and peer benchmarking send CEOs' pay soaring" (Washington Post, Sept 22) and this New York Times chart. The Occupy Wall Street movement protests economic inequality. The validity of this cause is self-evident. when it comes to this type of data you can spin the story the other way stating that the bottom 90% never had a chance to gain the majority of stocks mutual funds security ect. because they never had the resources that the top 1% did. although in some cases a middle or lower class citizen worked to become a top dog most have come from high class families in which they inherited not money but resources to earn their own money, resource most would only dream of. and of course the top 1% own and run wall street and hide behind their own money and power. it is the perfect villain because the lower 90% though they have the numbers do not have the money power or resources to overthrow the society we have created. the rich get richer and the poor die trying. I actually found it very interesting the variety of occupations that the 1%ers hold. There were farmers, blue collar/ service (what exactly is that anyways?) and skilled salespeople. Skilled salespeople. The biggest strategy in the 99%ers campaign is to allign with the common man. They promote the image of the grandeur top 1%er sitting on a lawn chair near the pool adjacent to the tennis courts who doesn't want to pay taxes so they can keep their swimming pool full of dollar bills and jump around in them. The chart featured is indeed detrimental to that image. It portrays a very different picture. A wide variety of likely intelligent and hard working people (mostly) who have earned their money through good old hard work and perseverance. Is this true? Perhaps. The "What they Own" chart was also very revealing, but this helps the 99%ers position and fuels the stereotypical 1%er image. The 1%ers own 50% of stocks and mutual funds. 50%!!! There's a LOT of money in the stock market to be owned, and the concept of one percent owning 50% is jaw dropping. The same trend is reflected in business equity and financial securities. 1% owning 50-60%, on the very surface, is unfair and intimidating. Are the 99%ers justified? Perhaps. I'm curious to see how they plan to bring about change in a system with a trend that has only been strengthening, even as our economy has been doing the very opposite. In order to define the top 1 percent would be difficult to with charts. It was stated before that data can be used in various ways to prove a certain point. It was mentioned in the article that the data did not play into the story being told. Obviously the data was not the exact one that would prove the story correct. The two graphs are very different one is grouping occupations together, whereas the other one is about stocks and who owns them. Two different charts so in this instance the graphs are skewed to represent the correct data and graphs that will compliment the story as a whole. Although the highest percentage of jobs which make up the top 1 percent was not very surprising, it was interesting to see the variety of jobs included. However, the chart based on income does have its limits. The rich are able to divert the wealth they receive from income to investments such as stocks and mutual funds. On the other hand, the top 1 percent do not necessarily own the most stocks as they leave most of their wealth in income. Defining the top 1 percent is a very complex task that would not fit neatly into a single chart. As people get richer, they store their wealth in a greater variety of ways, often to avoid taxes. Both of these charts give a very narrow view of what constitutes the top 1 percent of the country's people in wealth. The chart is detrimental to the stereotypical image of the top one percent, but a large percentage of those shown as the top 1 percent are still executives and from the financial sector. The generalization may be more accurate than other generalizations in this area, but it is just that, a generalization, not representative of the whole group. I think that because of the graphs and statistics that are used as evidence in this article, I find a hard time believing anything they say...mostly because we have recently talked about how graphs and statistics can be skewed to sway the audience/reader a certain way. Supposing the data provided as examples are factual in every way, well the first graph/chart does show that the professions tend to be skewed into various career fields...but that doesn't take away the fact that they do earn alot of money, which is why they are situated in the top 1%. The second graph only further supports the arguement that the top 1% should be taxed more because they have a ridiculous amount of money invested in stocks and such. In terms of mononpolies in a nation and such, it is not good for a person to have THAT much money, especially when the nation is in an economic crisis. I think that any person can get a hold of charts like these and tell their own story using numbers. Anyone can twist and turn any given data to support their own thoughts. the top 1%, whether they earned the money or merely inherited it, that money is essentially theirs. previously stated in this class, we realized that everything can be conned into persuading the audience to believe or want it. combining these two ideas, the number stories are only told to persuade a certain group about something that will benefit you in the end. you can skew all the data to help you get to that point. The top 1% should be taxed more, regardless of who they are or what occupation. People with money are not going to just through it away they are going to invest it so they do not lose it. Because of this, money stays up in that 1% and seldom goes back into the economy. If taxed, yes they will still be smart on how and where their money goes but more would go into what is necessary for the other 99% to continue to progress. Numbers can be skewed to say different things, but in reality we have a problem where the top 1% pay very little and the rest of us pay much more in comparison. This will only continue if the taxes are push on the lower classes and not the top percentile. Anyone have data on that? I have been following this protest. Its funny because Russell Simmons, who is included in the top 1%, claimed he wants his tax to be raised. He said that he makes enough money to pay more taxes and they would not hurt him. I remember with the Bush Tax cuts, Ben Afflect joked about the money he saved and how he can go on more vacations. He understands that he makes alot of money and does not understand why he should pay the same amount as someone who makes 190 times less. However, charts and graphic representations are skewed to the writer's opinion. It is obvious that the top 1% owns and invest more than those at the bottom. Is Wall Street the perfect villian? That is a hard question because they create many jobs for people. They should pay more taxes! I think my favorite part about this blog posting was the chart on the side showing who makes up the top 1 percent. Our class discussion on Monday was a lot about defining this group and there was much conflict over its meaning, and this post shows in concrete numbers exactly whom the group is made up of. Wall Street is in a sense very much the perfect villain. Though it creates jobs, the paraox here is that this money goes directly into the stock market, which is where many investers put much of their dough. I enjoyed reading about what people are considered in the top 1%, and it was surprising to see a few of the fields included in this section. Also, the fact that the top 1% was considered people who make just over half a million dollars a year was surprising to me as well. I figured the majority of these people would be at least millionaires, but then I remembered that one of every 100 people is in the top 1%, and it began to make more logical sense. In Scopes & Methods, I was able to truly understand all that goes into creating charts and what they entail. A main point that was always emphasized was the way charts are skewed. A simple restructuring of the way in which a survey question is stated can drastically change the outcome of your data. Keeping this in mind, we hold "mainstream" charts as valid and when individuals do present them, we need to be aware that they are most likely than not, being used to prove the points of those who are presenting it. It is not surprising that our wealth lies in the hands of the top 1% of our population and this is something that is extremely out of proportion. But can we blame those individuals for holding the power? Can we make a villain of someone who was inherited money or someone who obtained a degree and a job that help create or maintain that status quo? Do we blame those who hold the power because they take away from the average Joe being able to obtain the American dream? Are we trying to create a fair balance between wealth and how it is allocated amongst the population? If we go by means justifying the end result we are stating that we don't care how we make it happen as long as our task of removing the wealth fromt he top 1% is completed. I think it is wrong for these protestors to be protesting against Wall Street. Yes, I'll agree that Wall Street has done it's part in contributing to this economic downturn but they are missing the real masterminds behind the economic downturn. It is through policies from different administrations that set the pace for this current economy. Too much spending on free entitlements and foreign nation building and the rising cost of goods due to inflation caused this recession, along with too many regulations and taxes on business. It makes me laugh to think that the protestors are protesting against Wall Street when they could use that time to be looking for a job. I was reading these stories from various protestors who wrote that they were in debt because of many college loans and they were complaining about not being able to repay their loans. Well, lets think about this, any rational person would consider if you don't think you'll be able to do something, then you probably you wouldn't do it. So why would you take out a federal government loan with a huge interest rate when you know you probably are not going to be able to pay it back in the near future. And through some of those stories, the protestors were saying that they wanted to have their student loans paid free and clear. Well who would have to pick up the tab, it would be the middle class and the rich who pay most to all of the federal taxes. So to say its fair to have people who worked hard for their money to pay more is ridiculous. If your gonna blame anyone blame the lawmakers for implementing bad policies. The federal government where the ones who caused the housing bubble to burst and they gave Wall Street bailout money that they didn't deserve. When looking at this data, I see just the framework of the 1%. The fact that the 1% own a lot of stock is a bit irrelevant because if someone wants to own stock they can (although at times risky). I still feel that with all this data, we are only getting a little piece to base our decision on if we should "spread the wealth" or not. I still personally believe we can still tax the wealth a bit more than the other 99% since they have a lot of money to spare. It wont kill them if we take some taxes away for contributing is some way of them recieveing their wealth. However, I still feel the data was biased in saying the 1% own everything so we must take their money because they are getting to powerful. In my personal political opinion and am in opposition to the protesting of wall street. I believe they have every right to protest, however, their basis for protesting is not very piratical or in my opinion valid. We were recently talking about if we should tax the rich more. Just because the top 1% consists of the wealthiest people in the world doesn't mean that they deserve to be taxed any more. I am from the middle class and by no means can begin to fathom the wealth we are talking about. Would I like to make more, would I like to tax the rich so they can take more of the burden off me, would I like to blame my problems on the wealthy and say it is their fault? Of course I would like to find an easy answer and that is all this is. An easy answer to everyone's problems, a scapegoat. But on principle and my beliefs, no we shouldn't tax the rich more because they are rich. And it is quite obvious in every discussion I have had on this matter, in class or not, that it all stems from framing and storytelling. We need to move past that and get the pictures of the Hilton sisters out of our heads and be realistic. The wealthy earned what they have and if we put it in the context that most closely relates to us then maybe we as the 99% can be a little more realistic on the issue. From what I've seen, for most, Occupy Wall Street is a fad that will die out. If you visit Venice Beach here in California and ask the "protesters" what their goals are and to explain their validity for sleeping outside, smoking weed, and partying while saying their doing it for a cause; I'm sure most will repeat what they heard without forming their own opinion or give no clear answer at all. However, I do believe there are some well educated professionals in the protests that do know what they want out of Wall Street, but I could not help to notice that while watching CNN this weekend a lawyer was interviewed briefly who was in the New York protests. I find it ironic that according to the chart, lawyers are of the 8.4% of the 1%. I am not educated enough to make a true statement on the validity of the protests, but I do believe in educating yourself fully on an issue before protesting. I think we need to focus entirely on what people want out of these protests. The wealthy should pay more because they have more money? Ok, how did they get this money? THEY EARNED IT! With most of these protesters being college students neck deep in debt, they are doing there activism play and trying to get the economic sector turned around, when they could be looking for jobs. I think the chart talking about all the differing professions is quite interesting and due to the various professions everyone is in and only 4.3% is not working or dead. Maybe many of those people have already earned there money and retired or inherited it and that would be an anomaly to the situation that the majority of these people have worked hard and earned there money going up the ranks. They put their time in and have come out ahead living the "American Dream" or whatever you want to call it. People need to stop worrying about protesting that will more then likely end in nothing, when they could do what is best for the polis and find a bloody job and pay taxes like everyone else. Although these graphs do seem to follow some of the rules of showing data I do still stay skeptical after all of the different things we have covered on data presentation. But I do believe that the bottom 99% is not representing the top 1% accurately. The range of jobs is quite large. But I do believe that the tax should be higher on those in the top 1% Just reading the description of what qualifies a person as being in the top 1% was astounding. I don't know how accurate that is, it seems outrageous. Someone making that much money can afford to pay a bit more in taxes. I think that charts tell their story in a certain way. The top 1% is too low they should tax the top 5% to change our economy and our debt crisis. Many charts will persuade the reader to feel a certain way. The top 1% can be taxed more but not the same as everyone else is taxed. I feel like these charts may make people think twice about taxing the top one percent. Only 30% of these people are the "fat-cat" bankers everyone refers to (by the way, the American people made money on the bank bailouts), and 15% are those that represent Wall Street. That leaves 45% of "average" people that are not in these stigmatized groups, which would change the thought process of many people. I think that the majority of America doesn't really know who the Top Percent of earners are. They have an idea, sure, but it isn't an accurate one. People get this idea that because others make more, so they should pay more. They don't look into why they make more or anything in depth. I bet the majority if they got to switch positions wouldn't want to pay more on taxes. If the top earners pay more taxes, does it mean they get more say in government over the people who pay less? All statistics can be skewed to prove anything, but it is up to American citizens to look beyond what is being told to them, and to look at the facts and create their own opinion. The rich get richer and the poor get poorer because nothing has changed in the system we live in. Its interesting going back to the sense of framing and how the other 99% make the top 1% out to be and in itself is ill represented. It goes as far as presentation of any sense of critical thinking and acceptance of what the graphs represent for the rest of the economic demographic of people. however this systematic representation of information limits a view of simply having the larger sum of the wealth but not the means behind them. Of where it came from, and their previous circumstances of living growing up and what they do with it to give back to the development of pivotal issues of the structure of society. Its too black and white in the means alone of what is presented to truly classify certain means of this division of wealth and how a part of the jobs are services to society. There are different levels that need be accounted for in this, fixing the economy alone something that need be looked at fully to maximize the means in which it is aimed to fix the divisions and the issues in the market and how that translates to the numerous circumstances backed by them in society. I would agree that the Occupy Wall Street movement should be less concerned with portraying Wall Street as the bad guy. Their argument would be more valid according to this data if they simply argued that anybody who has that much wealth should have a moral (or legal) obligation to share it with the general polis. It is easy to assume that the entirety of the top 1% in America is made up of greedy financial giants, this isn't the best argument for them to pursue. For while a significant portion of the top 1% would fall into this category, it would in my opinion be better to focus on moral obligation and good will rather than getting on the "bad side" of the most powerful people in the nation. The top one percent should not have to pay a certain tax that is enforced by the state. The money that these people have made is their money, they have worked hard for their money, and even if the have inherited the money from their family it is still their money. I think that the percentages can be changed so that it works out fairly for everyone so the people and the government is happy. Some people feel that the percentage they would be taxed is not a big deal for someone making over a million dollars, but put yourself in their shoes. If you have made that much money would you want the government telling you what to do with a certain percentage of it. There is a way that the polis and the government can be happy if the percentage was changed around. I do feel that the top 1% should be taxed more ,but a relatively close gap between them and the 99%. This post poses a very gray area surrounding the subject of whether or not to levy a higher tax upon the wealthies people in this country. I do not tihnk that a higher tax should be levied upon the wealthy in this country, mainly because they earned the money either through risk & luck or through hard earned cash. Whichever method they used, it is still their money. However, I do not think that they should be given tax relief or tax breaks, whatever you would like to call them, because they can afford to pay at least some of their hard or luckily earned money. I personally do favor a flat [income] tax because it is very fair to everybody, whether you may see it or not. Whatever you take in monetarily, the government should be entitled to a smallish percentage of it, therefore you are not punishing people for earning more money. This method does give more of an incentive, in my mind, to attempt to move up the social ladder because no matter where you may be, your taxes would be the same. Getting back to the article, and my point, the top 1% of the country should pay some amount of taxes, but they should not pay more than anyone else just because they can afford it. I do not disagree with the different tax brackets. Those who make more money can obviously afford to contribute more in taxes than those who make minimum wage. I wouldn't suggest a flat tax either, since it would have to be very flow for all to afford and by doing this even LESS revenue would be collected. However, just because they CAN afford it does not make them any more responsible for the national debt than any other member of society. In fact, these people are far less likely to use government programs because they do not need the help. With all blame aside, I just do not believe that the top 1% should be held responsible for the nation's debt issues. I view it as a punishment to those who worked hard to gain their level of wealth (yes, i know we can get into the 'what if' debate of how they became wealthy). If the wealthy want to make a personal decision to donate, they can do so by writing a check to the treasury. It would be gladly accepted and I would have respect for the people who chose to do so. Like some students suggested in class, who are we to determine how much wealth is too much?? I don't believe that the top one percent should be responsible for tax raises. There is a reason that millionaires have obtained their wealth whether they are intelligent, skilled, sneaky, determined, hard-working, or all of the above. Some people argue that the wealthy are wealthy all due to the market and the money of everyone contributing to the economy or their product/company. However, those wealthy people rose above others in one way or another to obtain their status. By creating a flat tax in which each individual or household is taxed the same fraction of their income, everyone would experience the same burden. While I don't believe in scamming or fraud, it does not seem fair to stereotype big businessmen as immoral people who only want people's money and therefor should pay more taxes simply because they can afford it. These charts are influential and deceiving in the way that they both lead to opposite conclusions. The first chart does a great job showing the distribution of "1%ers" among all different occupations. It is factual, simple, and serves as great support for the argument of those against a raise in taxes for the wealthy. Yet, when I then glance at the amount of financial security that the second chart shows the top one percent possessing, I understand how easily people's emotions are drawn into the argument for raising taxes on the wealthy. I feel that the charts, as we have learned in class, can be twisted and portrayed in any way that the storyteller so wishes. I do believe that people misrepresent the top 1% but I agree with what others above me are saying in that we should focus on the top 5% for taxing in hopes to help the polis. Although I know I wouldn't personally want the government to force me to pay a percentage but in the end it's not about personal interests but the interest of the polis in government. I disagree that the top one percent should have to pay more in taxes than the bottom 99 percent. The people in the top one percent worked hard and earned their money and shouldn't be punished for that. Wouldn't that defeat people's goals to be successful in life if they just get taxed more in the end? Even though it is harder for the bottom 99 percent to pay the same tax rate, we shouldn't make it just as difficult for the top 1 percent to pay theirs. That will lower the amount of people able to pay their taxes and thus lower the amount of money the state gets. First off, I do agree with the Occupy Wall Street movement, but it is not just all about the 1%. However, in terms of just that aspect of the movement, I do believe that the top 1% should definitely be taxed. I believe it was Mike that said in class today that this is the only way to balance out the budget, and I slightly agree with that. I think that there are more ways than just that to balance everything out and maintain some sense of calmness in this area of our system, but taxing that top percentage of people is definitely a good start. I watched a 30 second commercial about the movement, and I agreed with two things. One girl said something along the lines of agreeing with the taxation of america’s richest so that the money could be given to education, and I definitely see that as something helpful. The other statement I most agreed with is when one man said “I want true democracy for the 99% of us that don’t have it anymore.” I agree with him because it is very apparent that the bottom 99% of us truly don’t have the power and say in things that the 1%ers do. That being said, I do agree with the people in the movement challenging the concentrated wealth. As for the story of the people in the top 1%, I found the chart very interesting, and I do think that the “stories” of those people matter, regardless of if the objectives are met or not. To have a well functioning polis every member needs to make a contribution in the form of taxes. As long as we have things that are public, like roads, schools, libraries, etc. we need to contribute our part to the good of the whole. I think that the amount of taxes you pay should reflect your income and wealth. If you make over a hundred times more a year than the normal US citizen I really think their tax percentage should reflect that. So, even if the top 1% are "wealth makers," like entrepreneurs, they still have a responsibility to the polis and their fellow citizens. And, if they are already making so much money they probably don't even notice that some of it goes to taxes. I found the visual representation in the charts very interesting and informational. Talking about the Wall Street protestors, I believe they have every right to be out their protesting and support that they choose to excercise their rights. It becomes sketchy though when talking about taxing the wealthy more. I do acknowledge that these people often times have money to spare, but also that they do pay a significant amount in taxes and they dont just get a free ride because they are rich. They pay a significant amount of taxes especially within the United States while about 50% of the population doesn't contribute to federal taxes because of tax breaks for those not well off. I believe in most cases attmpting to vilinize someone better or worse off because it favors your side more is just petty and a waste of time. A collaborative effort to balance how much more the wealthy should pay and any benefits removed from the population at large should be created. In good times or bad everyone who is a part of the polis must pay their share to keep the community strong. How do you know this is accurate information being provided? Anyone can get a hold of charts like these and make them look any possible way so that it validates their point. It’s hard to believe what’s right and what’s wrong when you don’t know how accurate the information being presented is. However based upon this information presented I do not necessarily believe its right to tax the top 1 percent more. Yes they do earn a lot more money than others but why should we make them pay more for our dept when they have worked hard to get to the point that they are at. I think different tax brackets are good to have but I just don’t believe in making the top 1 percent bracket extremely higher than all the others. One it isn’t truly unfair and just because they have all that money doesn’t give them the liability of everyone else to pay off the dept. When taxing everything needs to balance out. You can’t just We should always look for the easy way out , and by taxing the top 1 percent more will be exactly that. When looking at these charts and numbers, it is hard to change my opinion about the top 1%. Data visualization can so easily be manipulated in order to tell a story a certain story to the public. Now when looking at any kind of chart , it is hard to determine what story is trying to be told. When looking at the chart that tries to show that the top 1% consists of every occupation, it is hard to pick up on this because the percentages are so small. It seems if top 1% were taxed a higher than it would benefit the polis as a whole. However, it is also hard to determine whether the extra tax would be any benefit at all because to control the direct line of the money is merely impossible. In order for a country to be prosperous and to continue being successful it is important that the cap between the top and bottom does not grow too significantly. It is a moral obligation for those who have the capability to help the bottom to do so, but then again who can actually define what is considered moral? I do think this weakens the occupy Wall street rioters (yes I call them rioters) position. The list of demands and causes for which people are gathered is not cohesive, but the original primary target was/is wall street and the rich cats who have made their wealth there and become the 1% that holds the majority of the wealth in America. I mean it's called occupy wall street. These charts, however, tell a different story. Based off of the chart we see that a significant portion of the 1% are in fact working people who provide various goods and services and through their practice have amassed wealth. As for the other chart and the claim that "the top one percent owns a majority share of the nation’s stock/mutual funds, securities, and business equity) when compared to the “bottom 90 percent” is unfair because this is not considered a legitimate way to make wealth is dubious to me. These guys were proactive and sought opportunity and took chances and it paid off. It is not as if they did absolutely nothing and a pile of money fell in their lap. Regardless of any opinion on the issue of wealth and taxation, the manner and conduct of these protesting parasites is sickening and just silly. I called them rioters earlier because that really is what they are doing. Defecation on police cars, 700 (or more now probably) arrests and just general rabble rousing is conduct that I would consider riotous. The demands are absurd, inconsistent, uninformed and entirely unpractical and show a complete lack on realities grasp. This young man seems basically well behaved but he doesn't even know what he is doing. I also agree with the Wall street movement. I believe that Democracy has been put into the hands of the top 1% and, in some ways, taken away from the other 99%. Big business and finical powerhouses are bound to control the economy in a recession. Bail out's are going to come first over things like universal healthcare. I believe that the United states has created this damage by sugar coating the damage that has been created by big business. The top one percent at some point needs to realize the idea of "pay back". Big Business sent jobs overseas increasing the long term unemployment rates and left qualified American workers with no hope. If the top 1% made their money by taking the easy way out and hurting the U.S. economy don't they owe a bigger chunk of percentage out of their pay check? Is it their responsibility to help fix the problem they created? Will raising their income tax eliminate the lavish lifestyle they successfully created for themselves through hard work? "Does it matter if the story of who constitutes the “top 1 percent” is more muddled if the objective is met?" Yes and no. Yes it matters that the way the story is being told is priming the audience to fall on one the side of the argument, as it prevents for the full disclosure of information. In the market model, information should be totally freely available, but when information is 'muddied' it prevents the free flow of democratic discourse. Of course if we follow that we are non-rational actors, than does it truly matter if information is not fully truthful? To me it seems that societal factors defer conscious awareness of policy issues regardless of story method and framing, so while they affect the outcome of beliefs, they do not solely perform this act. That is not to say that it is justified to lie about policy, but as much as I feel framing does dismantle democratic principles, I can not see an objective moral issue with it. I honestly don't think unequal wealth distribution is a problem. A lack of mobility, however, is a problem. This is what I think the OWS protestors are partially addressing. Lots of this has to do with the government. Families like the Kennedys and the Clintons stay in power for far longer than is suitable for a "representative democracy." Voting incumbents out is one of the things Wall Street is going for, but it doesn't seem very publicized. I think if the focus is moved to a lack of mobility, which doesn't really have a meme, it would be more honest. Whether or not the ends justify the means is hard to say, especially since the goal here seems to be missing any intermediary steps it would take to get there. An interesting discussion is definitely worth comment. There's no doubt that that you ought to publish more about this subject matter, it might not be a taboo subject but generally people don't talk about these subjects. To the next! Best wishes!! read about bucksflooder , this might interest you.